The best form of exercise is always to found outdoors. Be it running, climbing or cycling, nothing quite beats getting fit while enjoying the fresh air and serene beauty of the natural world. Unfortunately, due to the constraints of modern life and the fact that more and more of us are moving to densely populated cities, it has become harder to find the time and natural space to do so. In light of this we compromise and move towards joining a local gym. The issue with gyms is that they are not necessarily a good environment for everyone to exercise in. It takes a certain kind of person to weather the social aspect of gym workouts. Gyms are among the top reasons why some people put off exercising. For some, the pressure of seeing others with more appealing bodies or working harder is enough to put them off permanently. For those of us who would much prefer to exercise in the comfort of our own homes away from prying eyes, we are lucky enough to live in a time where there is an array of equipment specifically geared for home use. We no longer have the excuse of it being too expensive and too complicated to put together either. In this article, we focus in on climber machines and pick out the best models on the market. We’ve tunnelled down on quality, price and accessibility to form our overall option. Our hope is that after reading, you feel empowered to make the right decision and ultimately enjoy your home workouts to the maximum. What is a Climber Machine? What’s So Great About Climber Machines? There is a certain stigma surrounding climbing machines. They are often viewed as the ever-present, but often misunderstood staple of any gym. Many people don’t actually understand their function and consequently stay well clear, when in actual fact they are among the most intense machines out there. It has many names, ranging from vertical climber to stair climbing or simply climber, and it is essentially a device designed to replicate the effort involved in ascending a steep set of stairs or climbing a rock face. 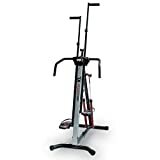 With the use of pedals that are pushed down by the user’s legs at intervals and hand grips to pull on, a climber machine provides an intense cardiovascular workout. What happens is that each leg has to alternately lift your entire body weight with every upward rotation. The idea is to improve endurance over time by strengthening the coordination between the blood pumping capacity of the heart and the lungs’ ability to transmit oxygen to the flowing blood. A climber machine requires the use of a number of muscles, including the core, both legs and both arms. As such, it is viewed as a full body workout exercise machine. Depending on skill level and desired length of a session, a climber machine can provide a light routine or a lung burning, strenuous session. This is a question we often hear. Sadly, many people are more drawn to well established machines such as stationary bikes, treadmills and elliptical trainers. This is understandable given their popularity. Yet, people really are missing a trick by shunning the climber machine. Here’s why. First up, in terms of the ratio between exertion to calorie loss, climbing machines rank very high. The simultaneous use of multiple large lower body muscles requires a more important cardiovascular response from your body. In other words, your heart has to work harder. When this happens, your metabolism goes into overdrive and burns off calories quicker to compensate. It is argued that using a climber burns twice as many calories as using traditional exercise equipment, though this claim is debatable there is indeed some truth in this. We’ve spoken about the high level workout climbing machines offer and this matched against the cost of getting one at home, the overall cost-effectiveness is through the roof. When getting a climber, you essentially negate the need for multiple exercise machines, shrinking them down into one all round dream machine. With this relative low cost in mind, it is easy to afford one for your home, and nothing beats being able to exercise in the comfort of your own garage, home gym or living room. They are also small devices in relation to other exercise equipment and are designed to fold away compactly for easy storage. They are also notoriously easy to set up and start using too. In addition, as they are installed in your home, they can be used either before your day gets going or after work, or even during your lunch break. In other words, you are not constrained by the normal opening hours of a full-blown downtown commercial gym and cannot use this as an excuse not to exercise. In relation to comparable machines, climbers provide more exercise for the same amount of use. This means that even a short 10 minute session every day yields tangible results. Of course, this is reliant on sticking to a daily routine, eating well and generally looking after yourself. If you do stick with it though, the outcome is great regardless of whether you are a seasoned exerciser or a novice. Another point to note is that a climber can act as a weight loss solution as well as a muscle toner. It can actually help build lean muscle due to the effort required. In essence, it is a great starter machine, yet can allow veterans to fine tune thigh, glute and even upper body muscles for noticeable tone improvement. One of the main concerns of workout enthusiast out there is the impact on their joints, notably the knees and ankles, particularly for runners. The climber machine is a virtually no impact form of exercise due to the upward motion of the legs that once high enough rests backdown on the steps. The pressure applied is gradual rather than sudden, unlike when a foot hits the ground when jogging. With his in mind, knees, hips and other joints are unaffected. One factor to keep in mind when considering a climber machine is the weight it can support. For most people, their weight should fall well within the bounds of acceptable limits. However, people who are overweight and embarking on a weight loss program may want to check the weight restrictions before purchasing. If you happen to live in a one bedroom apartment with limited space, then we recommend going for one of the more compact options. Another consideration the height of the climber and whether or not it will touch your roof when installed. Keep this in mind when shopping around. Also look out for an adjustable stride feature, this allows you to find the perfect length and ensures you get the best work while avoiding injuries. There’s also the height of the grips, though these are generally adjustable on most models. Pedal positioning is also a plus because if it can be adjusted, you can vary the muscles being used on your lower body. This point is particularly relevant for first timers who want to start on a low resistance setting to ease themselves into a regular exercise routine. If you start on a setting that is too hard, discouragement is soon to show itself and you can easily go off the whole idea due to it being too difficult. With this in mind, we recommend opting for a model with an adjustable resistance. Not only is this a wise way to start, but as you improve and gain muscle mass you can raise the resistance to match, ensuring you have a consistently good workout. Boredom is a huge concern for any regular exerciser and anything that wards it off is an advantage. Look out for models with programmed routines that vary the resistance to keep things interesting. Not only does a program vary the physical demands of a routine, it also allows your mind to focus on different types of efforts. That being said, a Climber workout is so gruelling that you won’t be able to concentrate on much else so factor this in if you are among those who are distracted enough by the physical exertion itself. Some models also offer screens to track you progress with markers for time spent exercising, calorie loss counters and distance climbed, among many other functions. If you are a numbers junky, there are plethora of displays with all manner of metrics to minutely analyze your workout. Among the budget models, we found the Conquer Vertical Climber to a great option. Here, we have a low priced climber made of durable steel that folds away flat for storage and home use. Ideally suited for people weighing under 275 pounds and no taller than 6’5’’. Like the MaxiClimber, it is quiet when in use, yet slightly lighter weighing in at 29 pounds. Don’t let this worry you, as the construction is robust and durable. It does require some assembly with tools though even the most novice builder shouldn’t have too many issues putting it together. The Conquer is supported by four slip proof rubberized feet and has one set of stationary ergonomic handles and a set that moves in unison with your feet. The moving set is adjustable to fit your height. The gripped pedals are wide and allow some movement in terms of which part of your foot you apply pressure with. This allows a variety of exercises for different muscle groups. There is no adjustable resistance, but the Conquer matches the speed and pressure of your legs so you determine the tension and hence, the difficulty of the workout. As there is no display screen, you may have to use your phone or an auxiliary device to time your sessions. Another issue is that the cable mechanism used to create the pedal movement has been reported to wear rather rapidly, though this is after extended use so shouldn’t affect most users. Overall, this is well and truly a budget model, yet it is well built and sturdy. It offers a solid workout and with regular use shows some great results. The size and the fact that it folds so easily also make it a great product for the price. We aren’t all blessed with huge amounts of disposable income and with this in mind, we propose the Welso Climber as the all round lowest priced model on the market. You do get what you pay for, yet it is reliable enough to offer a decent work and won’t fall to pieces when being used. The Welso Climber incorporates a lightweight, space saving design made of steel that supports people up to 250 pounds. Set up involves pulling the two feet away from each other and that’s it, all ready to use. The four grips normally found on most climbers are available here, with the habitual adjustable set that moves in time with the pedals and the other stationary for upper body work. 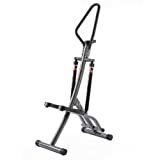 Though this climber machine doesn’t have adjustable resistance, it uses the weight of the user to mimic a hard workout. The display screen is fairly standard and shows session count, total count, time, calories burned and a sweeping scan function. Some complaints revolve around the difficulty in putting it together out of the box, though to our eyes the instructions are more than sufficient to do so. Otherwise, the Welso Climber is a suitable low budget option without any a no thrills set of features. Our model of choice in the budget category is the Welso Step Fit Climber, which incorporates a stepper and climber in one. Made of a robust steel frame, the Step Fit supports weights up to 250 pounds and itself weighs 81 pounds. Its weight and four rubber feet keep it stable when in use. It also folds in one quick motion for storing. It does require self assembly though the instructions are easy to follow. It is rather tall at 90.5’’ so make sure your residence is capable of housing it without any issues. As with most climbing machines, it has two sets of handles, one for stationary use and the other matching the pedals for that climbing effect. The second set is height adjustable and will suit the majority of body types and builds. The pedals are larger than most models to allow for the stepper function, though this doesn’t affect the climbing action with a workout that is as good as any competitor models. The motion is smooth without any unwanted jolts. Unlike many alternatives, the Step Fit has adjustable resistance, meaning you can change it to suit your strength or how good you feel on any particular day. The LCD display is also handy as it tracks your workout by measuring distance, calories burned, heart rate, and the number of rotations performed among other metrics. It requires two AA batteries to function and these are not included. You can also watch your favourite show while working out thanks to a shelf that houses your phone; a nice feature that helps limit workout boredom. The Step Fit looks more robust than other models in this price range and this isn’t purely cosmetic because it is in fact the most durable in this category. Overall, we liked the many features and the inbuilt stepper for a lighter workout on off days. If budget isn’t an issue, we highly recommend the Versaclimber. The price may be prohibitive though you do get a top of the line product that is fit for a full sized gym setting and will last for years to come. First off, it incorporates both a vertical climber and stepper, offering a two in one solution. Built with aircraft-grade aluminum and steel, the Versaclimber is solid and won’t budge on the ground thanks to a thick metal plate holding it firmly down. It can support up to 350 pounds. Size wise, the Versaclimber is compact and is not much bigger than much lower priced competitors. It folds away quite easily as well. Some assembly is required and the instructions provide a suitable guide as to how to do this. It weighs 65 pounds; not excessively heavy, but more so that the others in our guide. If anything this helps the stability of the climber. It is virtually silent and the manufacturer claims you can be in the same room with someone and the noise is barely discernible thanks to a plastic coated cable. A high claim, but one that rings true when it’s put to the test. The pedals are gripped to avoid slipping and can be adjusted to three settings to suit your size. The stride length and step height can be changed to anywhere between one and twenty inches. The movement is fluid and natural. There are no jumpy or jagged movements and the low-impact reputation of climbers remains intact with this product. There are two sets of grips, one stationary acting as a handrail for the stepper function and the other movable in line with the pedals. Each has three height settings that suits most users well. The programmable display incorporates time, calories burned, distance, and heart rate among others as well as three different modes, which are programs, standard and race. Overall there are 16 different routines to choose from depending on your intensity needs. You can also devise your own workouts fairly easily. It does require a nine volt battery to function though. Overall, this is by far the best on our list and is essentially a home solution that matches the quality and durability of a gym equivalent. The price is high, yet worth every penny, simply make sure it isn’t an off the cuff purchase and you use often to maximize returns. As a space saving option, we have chosen the MaxiClimber Vertical Climber. It is a steady balance of affordability and quality that should be within most people’s means. Though not the best and, by far, not the worst, it does the job well and is a straight to the point build with no added bells and whistles. This means simple design and nothing fancy. Its unique selling point is that it is smaller than many alternatives making it the most convenient and space conscious option. Firstly, the MaxiClimber is shipped pretty much assembled. The official documentation says 90% complete and this is true given that all you need to do is extend and lock in a supporting crossbar along the bottom of the frame. Removing the crossbar is all that’s needed to halve its size and store it in a cupboard or nook in your bedroom. It is also very light weighing in at just under 33 pounds, yet sturdy. The height is adjustable to five different positions so even the very tall can use it. The climber is made of cold-rolled steel and has slip-proof rubberized feet to ensure stability. It supports weights up to 250 pounds and the adjustable stride height of each leg is generous so long-legged folk need not worry. The machine is overall very quiet so you won’t bother roommates and neighbors. The MaxiClimber has four isometric non-stick grip hand positions. Two are stationary for when you want to work on your arms and the other two move in unison with the climbing motion of the pedals for working on the chest and pectorals. The two bicycle-style pedals allow you to shift your weight to alternately work on different leg muscles like the calves, thighs and buttocks. There is an inbuilt timer that starts and finishes with your workout, helping you complete a full session. The screen displays step count and calorie loss though these are fairly inaccurate given that body metrics are not input. Take these with a grain of salt and as suggested readings rather set in stone numbers. The screen is also oddly positioned for reading and you may struggle to read the results as you glide up and down. You can also get an accompanying app that tracks your progress and provides a 21 day challenge program, 80 recipe meal plan, wall chart and rewards in the form of more routines if you complete the challenge. The only real downside to the MaxiClimber is the non-adjustable resistance and its height. It is fixed and takes some getting used to. That being said, for the price, it is a real bargain and provides a solid, smooth motioned workout if you put the time in. If you are looking for a beginner model, we recommend the Sunny Folding Climber Stepper, a two in one climber and stepping machine. It has a sturdy heavy-duty steel frame with robust plastic components such as the rubberized feet that support up to 220 pounds of weight. Thanks to its simple, yet secure pin assembly mechanism and slimline design, the Sunny folds in one quick motion for easy storage in even the smallest of spaces. Of note, is the short height of the Sunny. You don’t need to have a ridiculously high ceiling like other models making it ideal for low apartments and garages. The large padded hand grip allows the user to alternate between climbing style workouts and stepper routines. The large pedals are hooked up to two quality hydraulic cylinders that simulate the up and down stride motion. The resistance can be set to twelve different difficulty levels to vary your workout. Set it to one and you get a low intensity session. Pump it up to twelve and you’re in for a challenge. The inbuilt LCD monitor records time, calories burned, total number of strides, session count and a scan function that jumps between the metrics keeping you on top of your performance. Overall, one of the best features of the Sunny is the low price. If a climber machine doesn’t end up being for you, you won’t have spent a fortune. The Sunny also retains a degree of resale value meaning you won’t lose out to much financially either. In addition, the simple setup and ease of use are geared towards novices who are not well versed in how exercise machines work so you won’t be messing around for hours simply trying to get it to function properly. Realistically, a climber machine can get quite tedious after a while so why not switch it up with a 2-in-1 machine that also incorporates an exercise bike. In that case, we recommend the Best Choice Total Body 2-in-1 Vertical Climber Magnetic Exercise Bike Fitness Machine. The frame is made of durable steel and is supported by non-slip rubber pads, weighing a total of 66 pounds and able to support up to 330 pounds. Setup is guided by useful instructions that most can adhere to effortlessly. There are four grips; two serve as handlebars for the exercise bike and a stationary hold for the climber, while the other two adjustable grips glide up in down to mimic the vertical ascent aspect of rock climbing. One side is a magnetic stationary bike with latch on pedals, a comfortable padded seat, an eight setting tension control dial and a screen displaying metrics such as time, speed distance and calories burned among others. On the other side is a vertical climber with gripped footholds and a smooth action so you avoid any sudden movements keeping your routine low-impact. There are no resistance adjustments though your own body weight acts to create enough resistance to make the work out as difficult as you need. 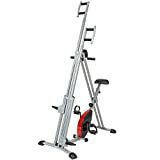 What we liked about this 2-in-1 was the ability to alternate between the two machines, using the bike to rest up yet remain moving after a high intensity set with the climber. As it can even be used by two people at once, it’s a nice communal way to exercise with your partner and friends. The price is also very attractive given that it costs much less than buying two separate machines individually. We aren’t all blessed with huge amounts of disposable income and with this in mind, we propose the Welso Climber as the all round lowest priced model on the market. You do get what you pay for, yet it is reliable enough to offer a decent workout and won’t fall to pieces when being used. The Welso Climber incorporates a lightweight, space saving design made of steel that supports people up to 250 pounds. Set up involves pulling the two feet away from each other and that’s it, all ready to use. The four grips normally found on most climbers are available here, with the habitual adjustable set that moves in time with the pedals and the other, which is stationary, for upper body work. Some complaints revolve around the difficulty in putting it together out of the box, though to our eyes the instructions are more than sufficient to do so. Otherwise, the Welso Climber is a suitable low budget option without a no thrills set of features. Our overall pick would have to be the Welso Step Fit Climber for the great balance of affordability, adjustable resistance, varied functionality and ease of use. It comes highly recommended and should suit the large majority of home exercise enthusiast and novices alike.